This is another tweet from the South East Rail Group. Because of centre door of the cab some start signals can’t be sighted by the driver. Thus SDO will be used and trains stopped short. Once ERTMS is installed (the trains already have the in-cab signalling displays to go with it) then fixed signals and triphandles will be removed. They also say that squiadron service is could be on March 11th. The tweet also confirms that ERTMS will be available on this line, after the first stage of installation of ERTMS on the East Coast Main Line. Currently, the service to Moorgate station is twelve trains per hour (tph) in the Off Peak, with extra services in the Peak. As Thameslink and Crossrail will be running twenty-four tph in a couple of years, so when ERTMS is working on the Southern part of the East Coast Main Line and on the Northern City Line into Moorgate station, how many trains per hour will be possible to Moorgate? The current twelve tph means that turning the trains at Moorgate must be done in five minutes, which having watched the process is fairly relaxed. Fifteen tph and a four minute turnround is certainly possible, as that is sometimes achieved in the Peak with the ancient Class 313 trains. With a fleet of twenty-five trains, and a frequency of twenty-four tph possible under ERTMS, I suspect that twenty tph and a three minute turnround at Moorgate could be achieved all day. With Dear Old Vicky gamely plugging on at thirty-six tph, the typical maximum wait in a cross-platform interchange will be as follows. Northern City to Victoria – one minute and forty seconds. How many passengers will use this route to the City rather than use the London Overground? The Northern City will be my link to Crossrail, as I can walk or get a bus to Essex Road station. The interchange between Crossrail and the Northern City Lines will be high capacity, feature a lot of escalators and be fully step-free. London’s forgotten underground line with its tragic history of the Moorgate Tube Crash, will become a new star in the broad firmament of London’s railways. It just needs some improvements to some of the stations. Ian’s article is a fascinating insight into how the foundations of some new tower blocks will be tested. The years and decades go by and the new Class 717 trains, just like their predecessors; the Class 313 trains, continue to change between 25 KVAC overhead and 750 VDC third rail electrification at Drayton Park station. There appears to have been little noticeable development in the forty years since the Class 313 reains were introduced. But the operation of the Class 717 trains appears smoother and quieter. I would have thought, that for safety reasons, the new trains would have used battery power between Drayton Park and Moorgate stations. After all it’s only two and a half miles, that is run using third-rail electrification. I’d be very interested to see how much power is used by the new Class 717 trains South of Drayton Park. In Weight And Configuration Of A Class 717 Train, I showed that the kinetic energy of a jam-packed Class 717 train at 85 mph is 56.15 kWh. I doubt that this sort of speed is achieved in the tunnels. At 40 mph, the energy would be just 12 kWh. Obviously, hotel power for air-conditioning and lights will be needed for the train, but even at 5 kWh per car per mile, that would only be 150 kWh. To carry 200 kWh of batteries on a six-car train is a very practical proposition. Vivarail have done it in a three-car train. There could be a short length of third-rail electrification to top up the batteries at Moorgate station, if required. Battery power could be used in depots to move trains, which would mean depots could have less electrification. Trains could be moved to the next station, if the electrification should fail. The route between Moorgate and Drayton Park stations, is probably one of the best and easiest in the UK for battery operation. In New Bank Tube Station Entrance In Final Stages Ahead Of Opening, Mrlvyn said this in a comment. I visited Moorgate Station recently and noticed the new lift of the Northern Line behind the hoarding. I then used escalator to go up to the Northern City Line which is directly above the Northern Line but there is no sign of work for the lift to stop at this level ! I have discovered from another site that Line will not be going step free due to arguments between DFT and TFL when Boris Johnson was Mayor and who should fund a hole in the wall for lift to stop! Plus ca change! 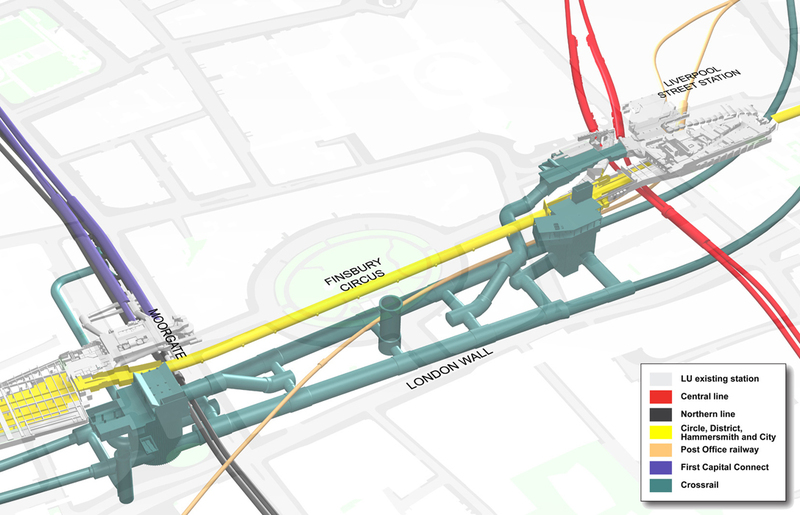 My company provided the planning computer and software for the Jubilee Line Extension. We heard stories of bad planning all the time and it certainly wasn’t a happy project. 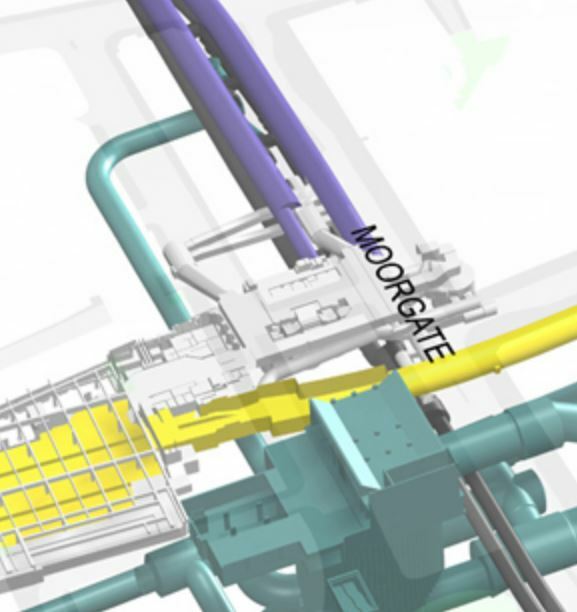 But look at this image, I’ve clipped from this large visualisation of the massive Liverpool Street-Moorgate Crossrail Station. The image shows the Northern City Line coming into Moorgate station. 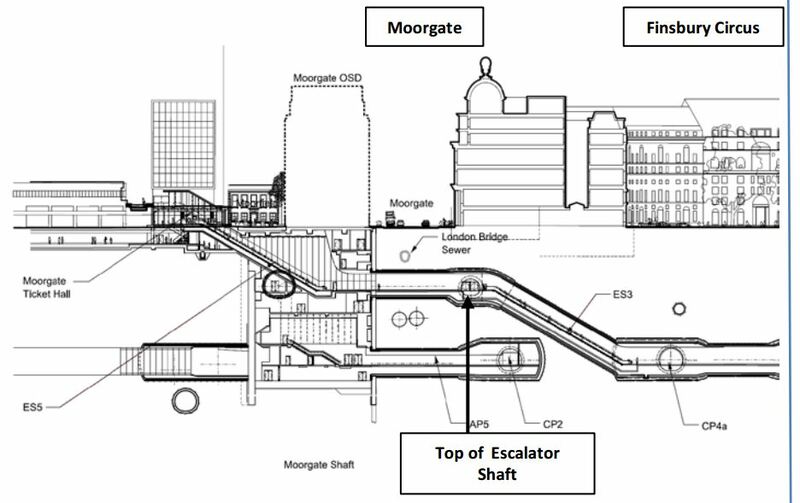 The escalator shaft to the existing ticket hall is shown in white by the letter M of Moorgate. The double tunnels from the stairs leading to the platforms to the escalators are shown in white underneath the Northern City Line. The escalators to the existing ticket hall are clearly shown. When Crossrail opens, passengers would seem to still do, as they do now to interchange between Norther/Northern City and the Sub-Surface Lines. The only problem now, is if you need a lift, there is none to the deep lines or in the subway under the Sub-Surface Lines. I am sure that the Crossrail reconstruction will address these problems. The big turquoise block is the new Crossrail station and Ticket Hall. This image shows a cross-section through it. It will be two escalators down from street level to Crossrail. But then rhen Crossrail is deep. In the visualisation, there is a new tunnel from around the centre of the Northern and Northern City Lines to the new Crossrail station. I am not sure of where it joins the new construction over Crossrail, but assuming that the visualisation is to scale, the tunnel is larger than a typical Underground tunnel. This size will mean that it will attract a lot of passengers. At the Crossrail end, if would probably connect by a level route to an interchange floor, where the following would be possible. Take an escalator or lift to and from Crossrail. Take a level connection to the Westbound platforms of the Sub-Surface Lines. Take an escalator or lift to street level. I suspect that would handle all connections except for step-free access to the Eastbound Sub-Surface Lines. At the other end of this tunnel, it would need to have large capacity and step-free access to the Northern and Northern City Lines. It looks like the Northern and Northern City Lines are being given a second route to both the surface and other lines through Moorgate. I shall go and have a look this morning. The two escalators connecting the Northern and the Northern City Lines are in good condition with refurbished walls and tiling. 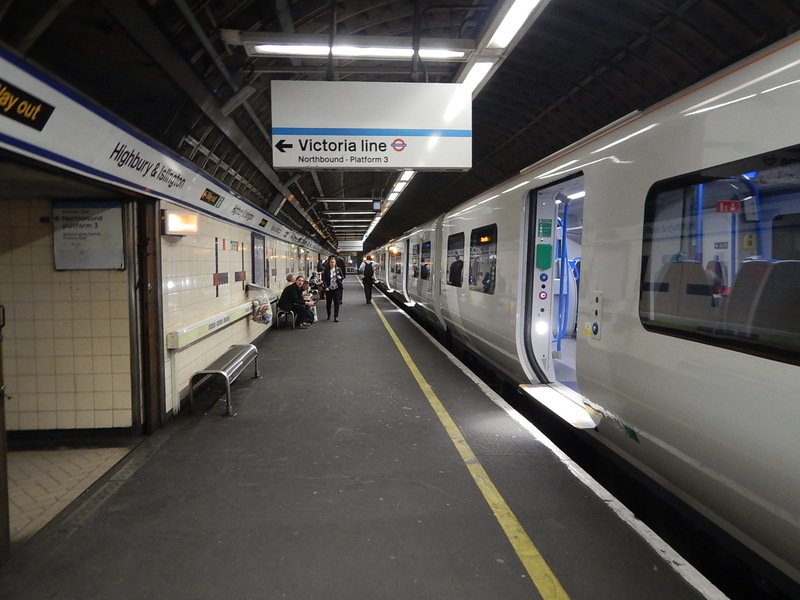 There are no tell-tale blue walls on the platforms for the Northern City Line, which still retains its Network South East livery. The blue wall, facing the up connecting escalator is wider than that facing the down escalator. There doesn’t seem to be any works for a lift to take passengers to and from the existing tickey hall. It looks like it will be a tight squeeze fitting in all the access stairs, escalators and lifts between the Northern Line platforms and the new tunnel, that is shown connecting the Northern Line platforms to Crossrail. I come to one or more of these conclusions. There will be other passages dug in the future. Passengers will continue to use the existing escalators. As Moorgate station is one of the busiest and will get even more so, there must be a sensible plan. The only thing I can find on the internet is this page on the Acanthus Architects web site. These pictures show the renewed tiling on the Northern Line platforms and tunnels at Moorgate station, as the station gets ready for Crossrail. My only thought is that compared to some London Underground tiling, is that it is rather unadventurous. Where The City Of London Leads The Rest Will Follow! The City of London is a unique Local Authotity, in that very few people live in its area. C and I used to live in the Barbican with our three boys. It was a very different experience to living anywhere else I’ve lived. It still functions today as housing and many have lived in the Estate for longer than forty years. It was one of the first high-quality Local Authority housing schemes in London and it showed if you built quality it worked. From what I’ve seen elsewhere, other Local Authorities and Housing Associations are building high quality homes for rent. The City is now tacking another problem in a radical way. This article on the BBC is entitled The Politics Of Pedestrianisation. Read the article, of which this is an extract. Next week, the local authority will take another step towards a bold, radical plan to change the streets in the Square Mile over the next 25 years. Some streets could be closed to motor vehicles during rush hour and there could be zero emission zones. There will also be a 15mph speed limit across the district. The local authority wants to cut the number of vehicles by a quarter by 2030. The City has consulted workers and residents. The article says this about the survey. It found 98% of people travel to the area by walking, cycling or public transport, while 84% think pavements are too crowded. Four in five people think traffic levels in the City are too high, with 67% saying it contributes to poor air quality, while 59% said it creates an unpleasant street environment. The authority said it listened to workers and businesses and has to deliver what they want to remain competitive – especially in a post-Brexit world. It also said it must improve the area to appeal to business and wants to change the priority completely, giving more space to pedestrians and cyclists. But black cab drivers don’t like it. Surprise! Surprise! Steve McNamara of the Licensed Taxi Drivers’ Association (LTDA) says pedestrianisation is being dreamt up by middle-class blokes who don’t realise how the milk for their caramel lattes is delivered. “They are strangling the best city in the planet and they don’t realise people need to have goods and services delivered,” he said. He thinks the march to pedestrianisation will kill The City. But I do like it! Look at these pictures I took in the City at about two in the afternoon. The banning of all vehicles except cyclists and buses has cleared the area around Bank, where it is now a pleasure to walk. A year ago, walking would have required a lot of traffic-dodging! It looks to me, that in a few years time, the City of London will be a square mile of tower blocks and historic alleys and buildings. It will be criss-crossed by cycle and pedestrians routes. Two or three major routes, will survive for buses and taxis. Around the City will be the ring of stations; Aldgate, Bank, Barbican, Blackfriars, Cannon Street, City Thameslink, Fenchurch Street, Liverpool Street, Monument, Moorgate, St. Pauls and Tower Hill. The massive Bank and Moorgate/Liverpool Street stations in the heart of the action, will be two of the largest Metro stations in the World. The City of London will become the Gold Standard for historic cities. Other UK cities and parts of London like Oxford Street will surely follow. I took these pictures on the route between Farringdon and Moorgate stations via Barbican station. The massive amount of new development along the route. The new site for the Museum of London. Smithfield Market, which surely will be developed or refurbished. The large amount of housing in the Barbican Estate. The new office developments surrounding Moorgate station. To me, one of the most interesting developments, is the creation of new walkways across the Barbican Estate and through the new office developments to link Batrbican and Moorgate stations to London Wall and walking routes going towards St. Pauls, Bank and the River. Crossrail will serve the City indirectly using a modicum of walking in at a pleasant height away from the traffic.